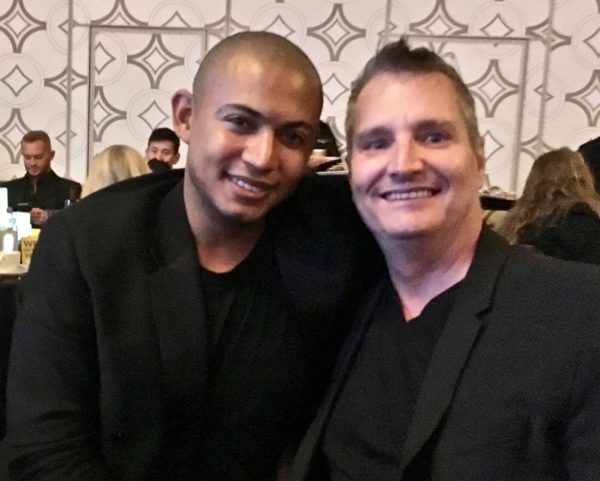 The quietest shift happened at the Human Rights Campaign gala in Los Angeles last weekend. 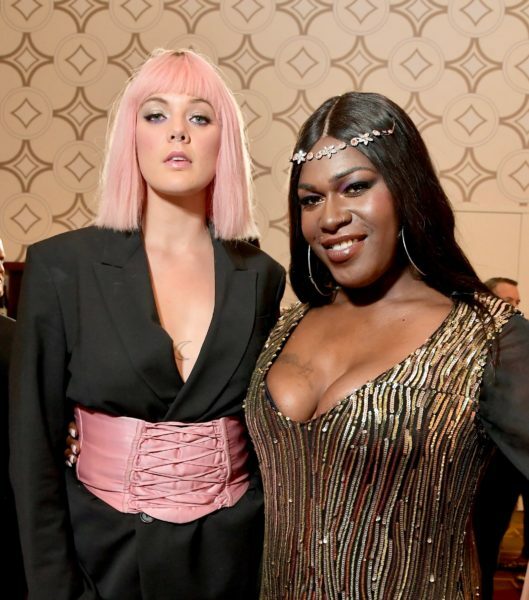 The stage was populated with more women, trans women and people of color than rich white gay men. And it was so normal, it went unnoticed. 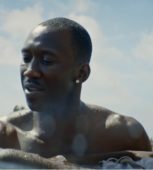 “Just want my piece of the American pie,” Diamond sang with swagger. 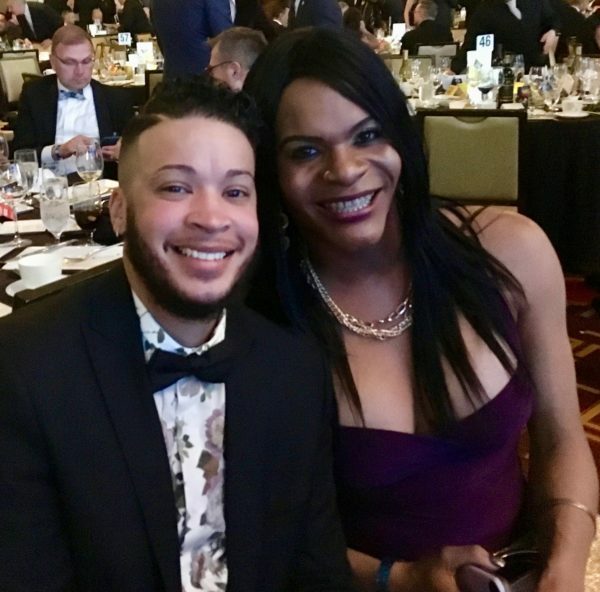 “Break the chains of old beliefs, I’m the flame that you can’t unsee.” And the black tie and gown crowd in the packed ballroom at the JW Marriott downtown jumped to their feet in applause and agreement. 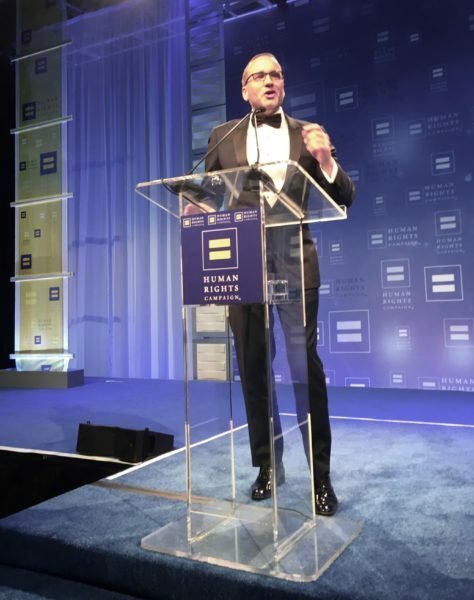 In his seven years serving as HRC president, Chad Griffin has transformed the nation’s largest LGBT lobbying organization into a “political powerhouse,” HRC/LA director Gwen Baba noted. 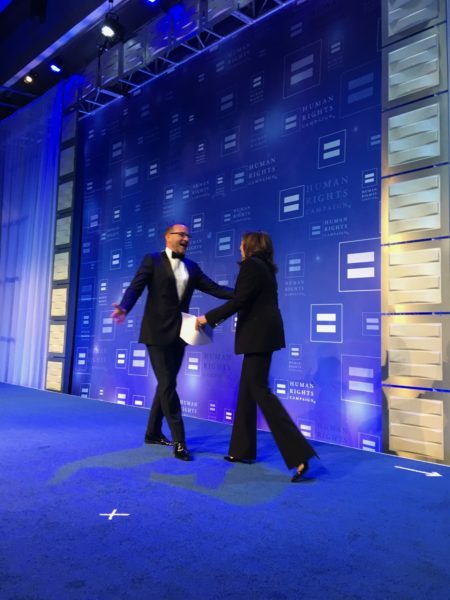 Now, on the cusp of his exit, Griffin is focused on the federal Equality Act, introduced on March 13. 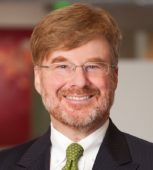 The bill would amend existing civil rights laws to provide protections based on sexual orientation and gender identity. HRC is now welcome at the national civil rights table as an intersectional equal, not merely as a political stepchild with deep ATM pockets. 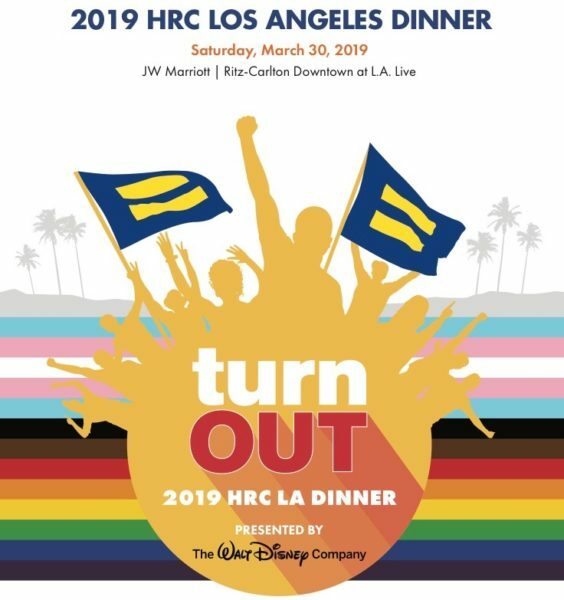 But as the HRC/LA gala logo illustrated, there’s also been a shift towards internal movement unity, signified by placing the transgender flag directly on top of the rainbow flag, with the black and brown stripes added. 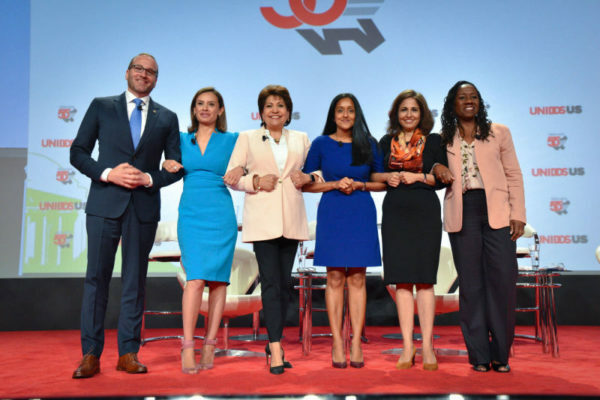 Unity in action—presented by the Walt Disney Company, which, to people of a certain age and business-minded entertainment industry folks, has a whole other resonance. Breaking the chains of old beliefs, indeed. Another subtle but significant shift was the sense of family equality. 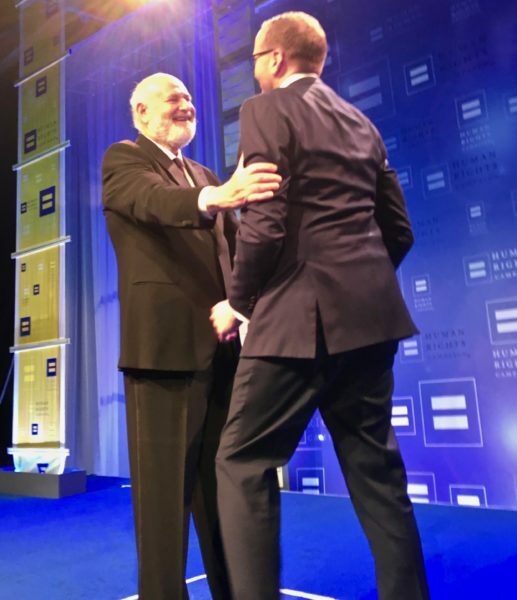 Heretofore, HRC audiences have largely been grateful for the attention from important public figures—such as when the late civil rights icon Julian Bond and Blue Dog Democrat Sen. Dianne Feinstein came out in support of marriage equality, for instance. This year, the undercurrent of love and support was more family at Thanksgiving than family forged by frontline battles in the culture war. 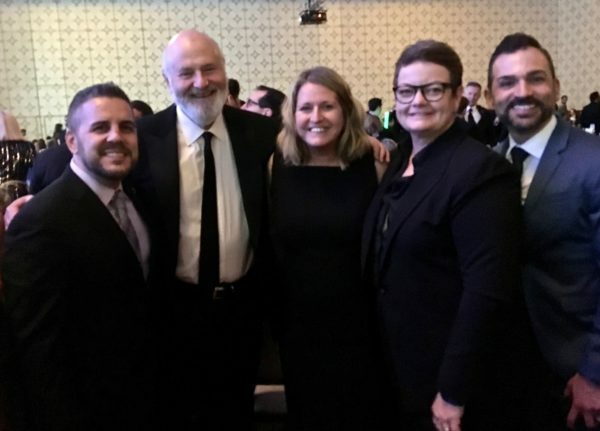 The father-son love between Griffin and actor/director Rob Reiner—with whom Griffin successfully fought against the tobacco industry and Prop 8—was so real, many choked up watching Griffin choke up. 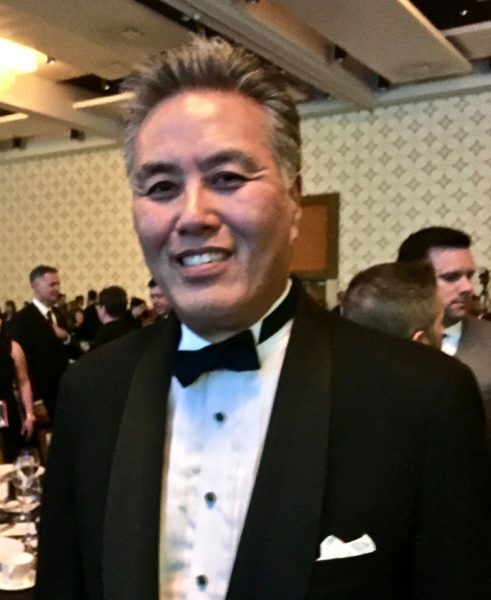 “The power of Donald Trump and his MAGA millions is not unlimited,” he said. 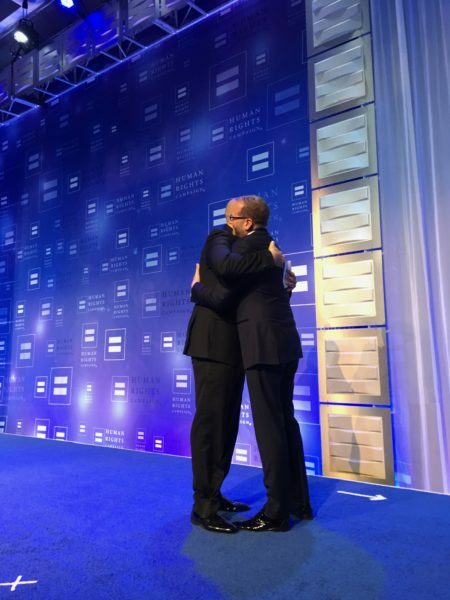 Griffin nailed HRC’s political power, having spent $26 million on specific, targeted races and helping galvanize equality voters to flip the House, including in traditionally beat red Orange County. 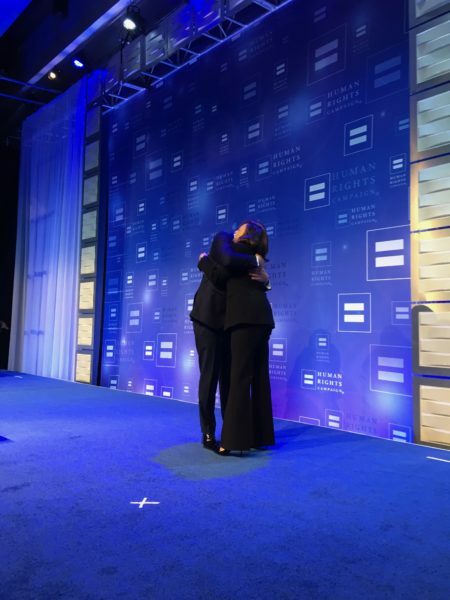 HRC turned out more than 7 million LGBT voters in the 2018 midterm elections, making the difference in numerous narrow races around the country. 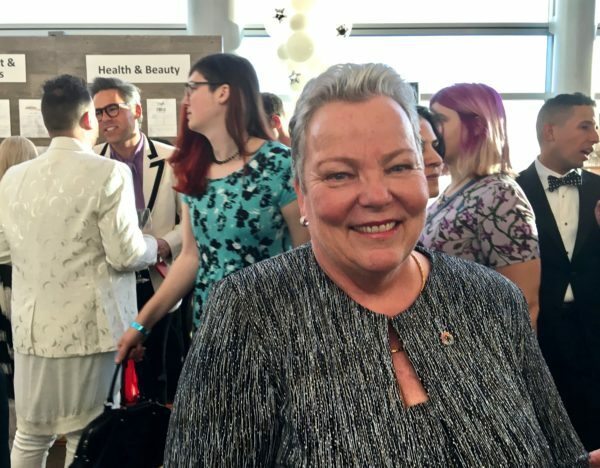 “If you come for us, we’re coming for you on election day,” Griffin warned. 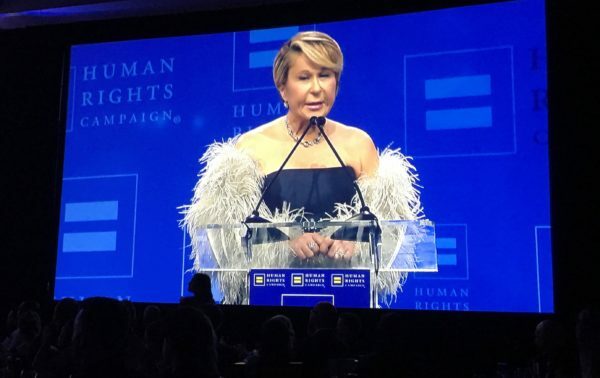 Griffin’s deep friendship with HRC National Leadership Award honoree Yeardley Smith was palpable, as was her fierce devotion to the cause of LGBT equality. “I am here to march with you, to rally together and vote to stop the relentless and systematic assault by the bigoted, vindictive administration that’s hell-bent on stripping us of all the progress that we have made, politically and humanly over the past 50 years,” said Smith, known for her TV character Lisa on “The Simpsons.” “You do not get to cherrypick someone’s rights,” she said. 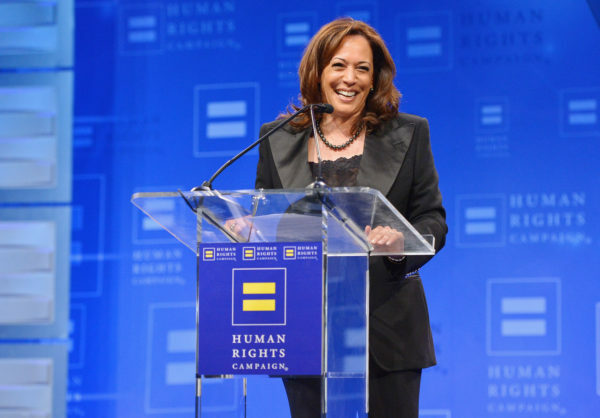 The two Democratic candidates for president—Senators Kamala Harris and Cory Booker—also felt at home, as if everyone had grown up together. 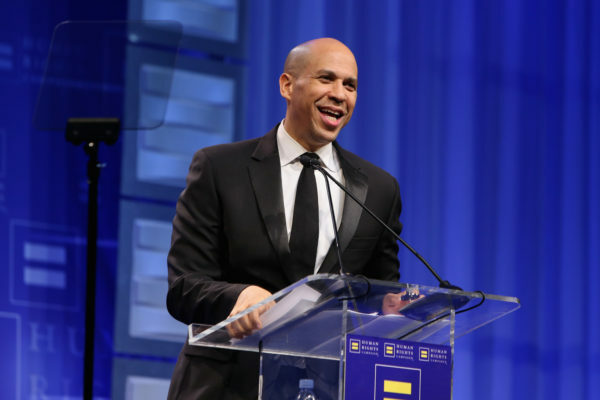 Booker joked about how often Griffin had asked him to speak and then delivered a passionate-pastor version of his stump speech that ranged from the “moral vandalism” of the Trump administration to an excerpt from a poem by the late black gay Harlem Renaissance poet Langston Hughes. 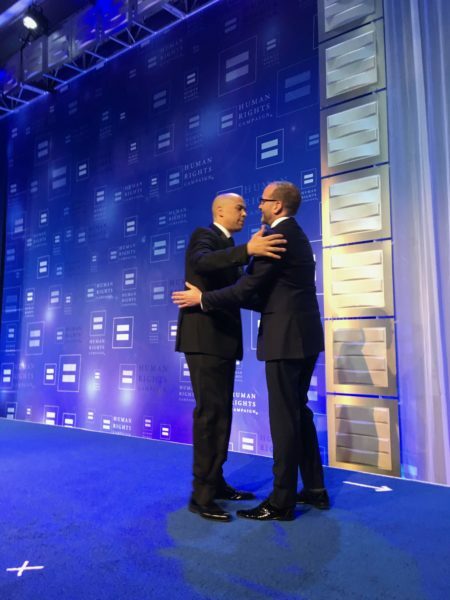 “Demi-gods in the White House and the administration are working systematically to undermine and dismantle LGBTQ rights—from President Trump’s discriminatory and un-American ban on transgender Americans serving on the military to the Department of Justice’s refusal to protect LGBTQ Americans from employment discrimination to Betsy DeVos’ failure to protect our transgender students,” Booker said. 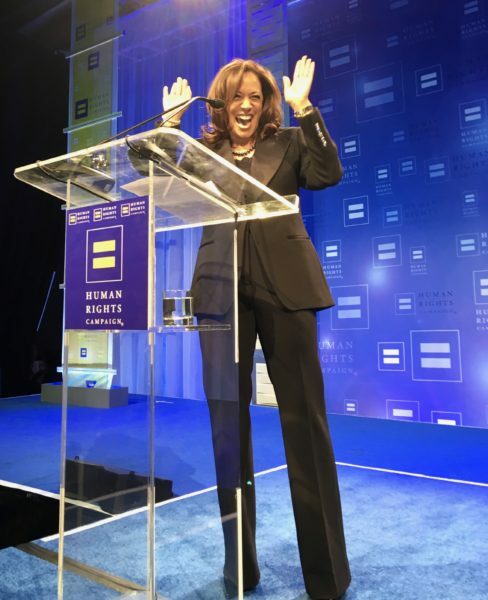 Harris had the home-field advantage, having refused to defend Prop 8 in court as California Attorney General. 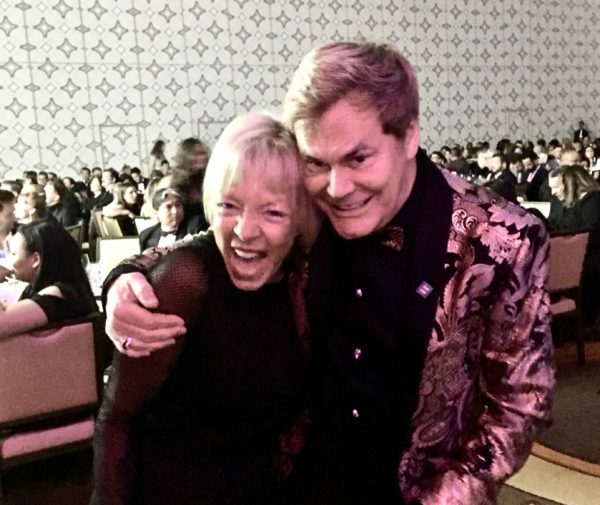 She officiated at the wedding of federal Prop 8 plaintiffs Kris Perry and Sandi Stier. And in that room filled with family that night, that was more than a political slogan. The hugs were deep and real. 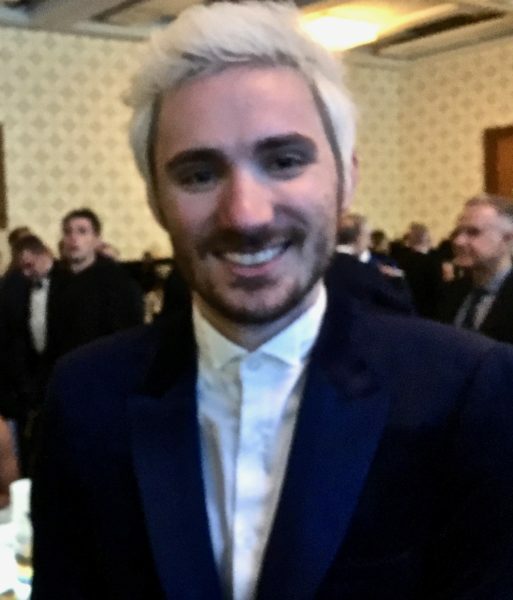 Sam Greisman – who recently participated in a video with his mother, Sally Field for Americans for the Equality Act – seemed actually kind of shy but very sweet. 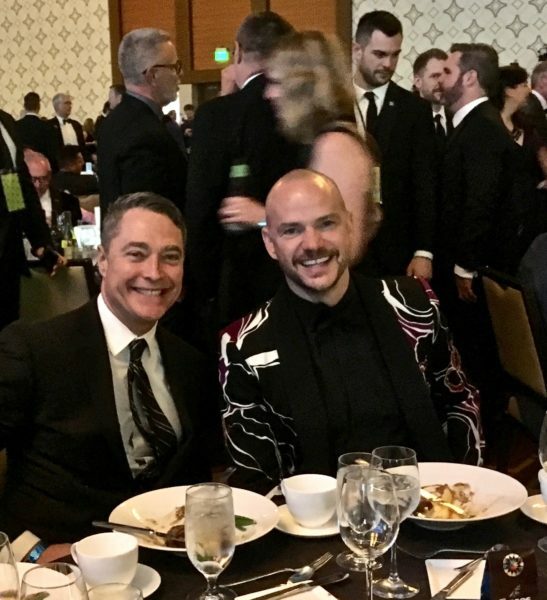 The Americans for the Equality Act public awareness and advertising campaign was filmed and produced by award-winning directors Dustin Lance Black and Paris Barclay, who was at the gala with his husband Christopher (they’ve been together for 20 years). 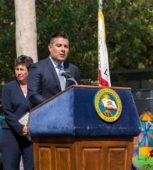 Barclay is an executive and directing producer of ABC’S “Station 19,” along with Shonda Rhimes and Betsy Beers. 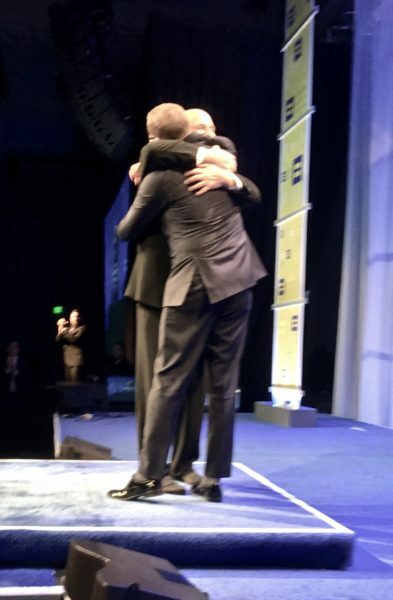 Equality Utah director Donna Weinholtz was happy to get a hug from philanthropist Bruce Bastion. 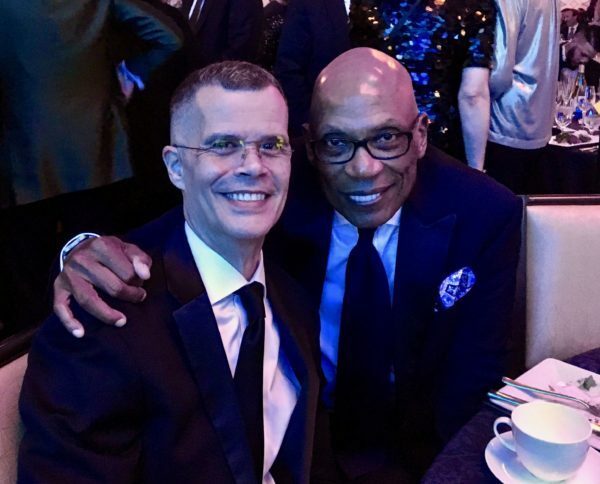 Freeform’s The Fosters” and “Good Trouble” creator and executive producer Peter Paige with friend Matk Smith. 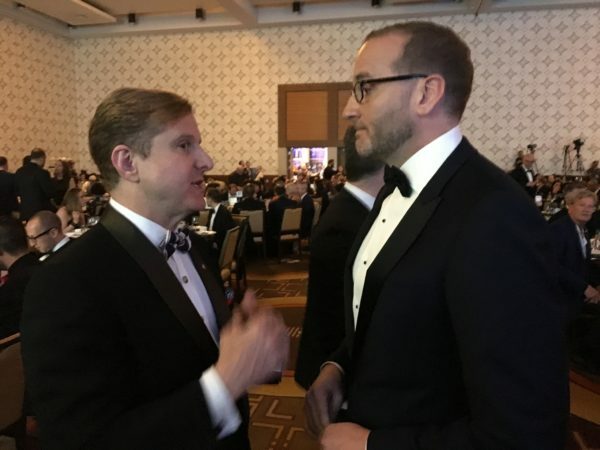 Chad Griffin chats with LA City Controller Ron Galperin, who on April 2 held a news conference with other LGBT officials calling for a boycott of Dorchester Hotels owned by the Sultan of Brunei, including the Beverly Hills Hotel. 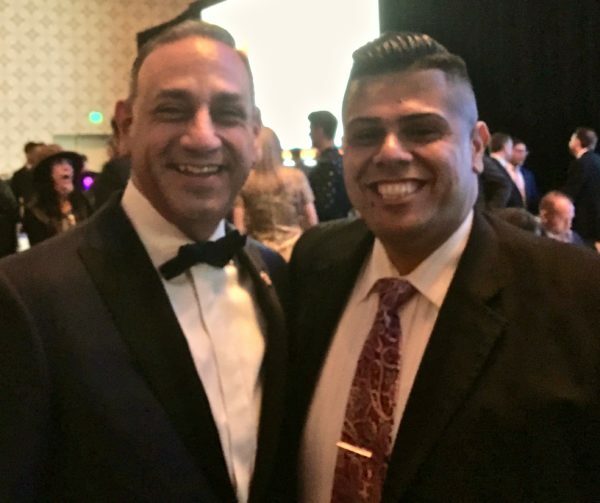 Jesse Medina and Blossom Brown. Brown delivered moving comments about being a trans person in the Deep South. “I love Mississippi and I love the South. 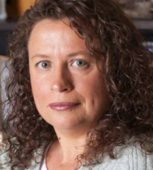 But it’s just not safe for me there,” she said, who became fast friends with Griffin. 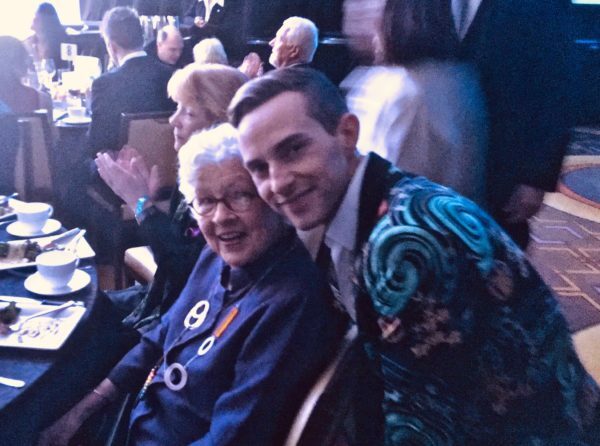 Champion figure skater Adam Rippon pauses to say hello to Betty DeGeneres, who became an HRC supporter and “mother” to many after her daughter Ellen came out. 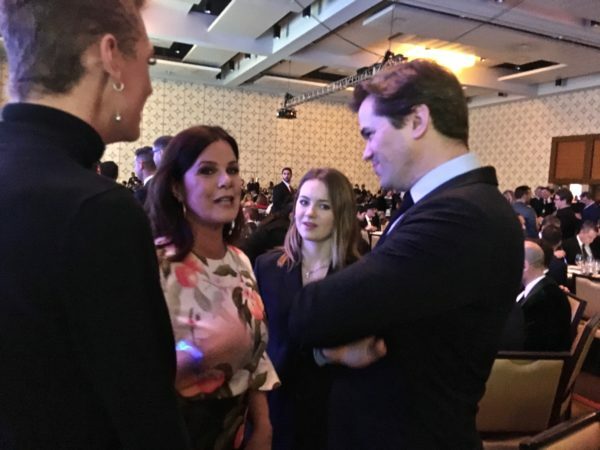 Marcia Gay Harden and Andrew Rannells chat as Julitta Dee Harden Scheel and Hudson Harden Scheel hang out. 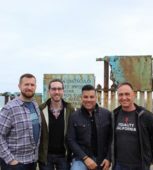 Turns out The Advocate’s Zach Stafford and Los Angeles Blade publisher Troy Masters were born in the same small town of Gallatin, Tennessee. 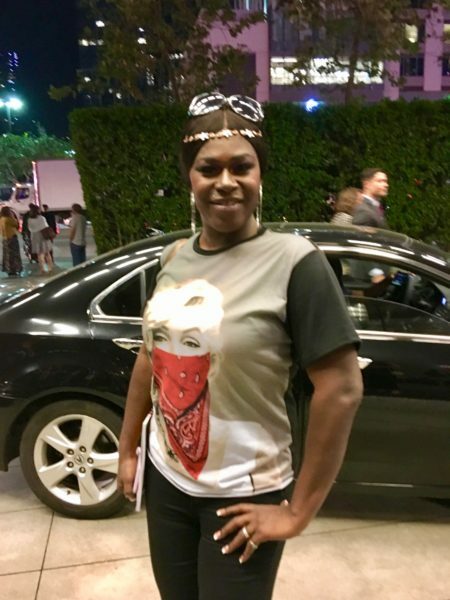 HRC/LA gala star Shea Diamond outside the JW Marriott after the gala, ready to hop in her waiting car and go home.